Did that heading grab your attention? Yes, on the same day I posted a comment about how I dislike misleading headlines, I am guilty of doing the same thing. Aren't I a little stinker? Yes the language translation service Altavista Babel Fish is no more. 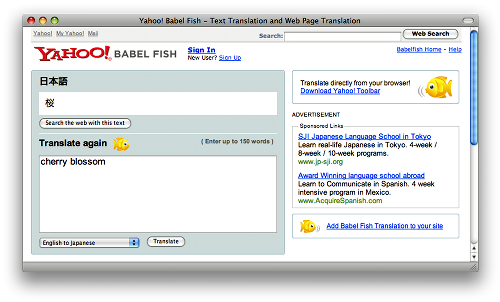 If you click on Babel Fish Translation in the footer of the AltaVista home page, you're redirected to Yahoo Babel Fish. One more nail in the coffin of what was once one of the web's greatest search engines. I remember back when we first got internet access over 10 years ago, back when I was still a starry eyed child in primary school. AltaVista, HotBot, Looksmart, Infoseek (before it changed to Go), Lycos, Northern Light, GoTo (before Overture), Yahoo… they were sites you went to when you wanted to find things. I remember filling my bookmark toolbar in Netscape with links to these sites so whenever I needed to research an assignment, I'd try each engine one after the other. They all had different directories and different indexes (HotBot aside, but I preferred the style). Now we have Google, Yahoo, Ask… and… Google. For what it's worth, I much preferred AltaVista's slick mountain logo. The new AltaVista is just a shell to Yahoo anyway. Older post → Australian daylight savings has started. Free map!